Being an Uber driver doesn’t pay as well as it used to. Photo by Melies The Bunny on Flickr. A selection of 8 links for you. You’ve got that ring of confidence. I’m @charlesarthur on Twitter. Observations and links welcome. The gig isn’t as good as it used to be for people working through online transportation apps in the US. 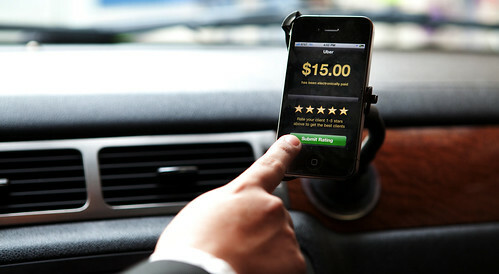 On average, drivers who transport people (Uber or Lyft) or things (Uber Eats or Postmates) through an app made 53% less in 2017 than they did in 2013, according to a new study by the JPMorgan Chase Institute that looks at online gig economy payments into Chase checking accounts. The average monthly payments to those who worked for a transportation app in a given month declined to $783 from $1,469. Meanwhile, people working for leasing apps — Airbnb, Turo, Parklee and other apps that let you rent assets like your home, car or parking space — saw their incomes from those platforms rise 69% to $1,736 on average. The share of the working population that has participated in the online gig economy at any point in a year rose from less than 2% in 2013 to nearly 5% in 2018. That’s about the same share of people employed in the public administration sector. To own the remaining shares of Pandora, Sirius has agreed to offer a fixed exchange ratio of 1.44 newly issued Sirius shares for each outstanding Pandora share. The transaction values Pandora at $3.5bn. Importantly, the merger agreement gives Pandora a “go-shop” period in which the company can actively consider deals with other parties. This means that if other companies are interested in acquiring Pandora, they still have a chance to enter into negotiations and make a better offer. The deal will create a number of synergies, Sirius and Pandora management believe. First off, the combined company would create the world’s largest audio entertainment company. Sirius boasts over 36 million subscribers in North America and more than 23 million users on an annual trial. Meanwhile, Pandora has over 70 million monthly active users and about 6 million paid subscribers. Pandora has lost money hand over fist for eight years, and wasn’t slowing down. Sirius is going to have to do some pretty amazing things with advertising and subscribers (the latter has, to be fair, been a space where Pandora has been growing – but the subscription business is a small one trying to escape a big, loss-making one). Since January 2016, Pandora’s operating loss is a billion dollars; in the first half of 2018, $200m. Shazam is already integrated into Siri: try asking Siri to “name that tune” or “what song is currently playing” and it will listen and provide a Shazam-powered response with a link to Apple Music. Perhaps iOS 13 will feature an always-listening song ID feature like that on the Pixel 2. There’s probably more Apple could do with Shazam and HomePod, too. At the very least, we can hope that the Shazam app quickly gets an update to add support for Siri Shortcuts and the Siri watch face on watchOS 5. This is a classic one for Stratechery’s Ben Thompson to go into (and I expect he will, while you’re reading this). Apple, a vertical (hardware) company buying Shazam, a horizontal (services) company. Shazam is best served by being on the most devices, in the hands of the most people. Can Apple, which usually want to benefit from exclusivity, really use that? In the case of Shazam, I think so: Shazam (as a music-recognition app) has the pulse of what people are interested in hearing. That’s a huge bonus for a company with a paid music service which wants to know which artists to feature. So I think Shazam on Android will continue; removing the ads is neither here or there. It’s more valuable on multiple platforms. As you might have heard, Chrome 69 automatically logs you into the browser when you log into any Google property. As much as I might like Chrome (and Google), I was quite displeased by this particular change: I assume it was in the release notes (that probably a vanishingly small number of Chrome users read), but the rationale that’s been given for the change doesn’t really make sense, and in any case I really prefer not to have anything synced anywhere. It definitely (for me at least) violated the principle of least astonishment: I can’t speak for anyone else but I personally don’t expect a routine software upgrade to suddenly start uploading passwords somewhere, or copying my passwords onto any random computer I happen to log into. As noted in the first article above, the Sync enabled/disabled UI was singularly confusing to me as to what the state of things are, and a careful search (well, about 1 minute) through the Chrome settings pages didn’t really shed much more light on exactly how I could guarantee no data gets inadvertently synced. I set out to figure out how I could keep using Chrome but still feel relatively comfortable that Chrome Sync wasn’t helpfully distributing my data. After a couple of hours running around I finally got it together thanks to https://www.chromium.org/administrators/policy-list-3. It’s a couple of commands in the Terminal window, or two lines in Windows Registry. “Fingerprint, face or PIN”. The latter doesn’t feel that far away from a password, to be honest, though I suppose if you’re having to put it through your pre-authorised Windows Authenticator app then it adds a faint sheen of extra security. As of May, only 12 Tesla tiled roofs were connected to the grid, all in Northern California, according to Reuters. Tesla declined to give an updated figure, but Musk later clarified that his “several hundred homes” comment refers to roofs that are scheduled for installation or are partially installed. Tesla has been accepting $1,000 deposits for the roof tiles since May 2017. But at that point, the company wasn’t even close to mass producing them. It established a factory in Buffalo, New York to make the tiles, but it’s not running at full capacity yet. At the company’s most recent annual shareholder meeting, Musk blamed ongoing delays on a need for more testing. …One of the customers with the tiles already installed is San Jose resident and Tesla Model 3 owner Tri Huynh. He preordered them as soon as possible, and the roof was installed earlier this year. “I was actually extremely surprised I got the call, just because you never know what this stuff, right. I thought there’d be extreme delays, I just didn’t know how long it was going to take,” said Huynh. While traditional solar panels can be installed in a day, it took a team of 10 to 15 workers two weeks to install this roof… Tesla’s customers are paying a premium for the tile’s sleek look. Huynh’s roof cost him about $100,000, though he did need to replace his roof anyway. “I don’t think this will ever pay for itself honestly,” he said. The device has a codename of ‘Portal,’ and reportedly will use facial recognition to detect who the user is. Video calling will be the primary feature, and leaks have shown it will be tightly integrated with Facebook Messenger. A new report from Cheddar claims there will be two screen sizes – one priced around $400, and the other $300. After the company’s privacy scandals, Facebook reportedly made some last-minute changes to Portal, including adding a privacy shutter to the front camera. Cheddar also reports the device will have Alexa, and that Facebook has shown Portal to major retailers. This only has to go wrong in some tiny way for Facebook to sustain another PR calamity. Equally, it might just not sell. I can’t see a huge upside – though maybe there’s a (mature) generation that’s eager to have a “Facebook videophone” in their kitchen. I don’t think it would be kids, though. Also in today’s news: Google is making a new newsfeed, calling it something, and putting it somewhere. What strikes me about this is that there are a lot of of proprietary newsfeeds, AI-assisted to take user preference, click-through rates, ad revenues into account. Yet the best way to get one’s news is subscribing to RSS feeds from carefully chosen, properly edited, reputable sites. But the *important* news is not that there’s yet another newsfeed: Journalists et al are being way too reactive/naive/passive. I’ve seen a lot of articles about this gNewsfeed and the ones before it, but none, NONE ! mentioned that RSS lets you choose for yourself where you get your news from and is really better, especially in this era where having you + editors chose articles has proven to be way better than having monetizing-focused algorithms do it. To me, that is the news worth reporting, or at least mentioning, not “hey, another newsfeed”. But there’s no big company with PR drones pushing RSS – Google actually killed its RSS service a few years back-, so RSS gets no love. That’s disappointing, especially from a clique quick to take issue with and report on fake news issues. Feeds is where they start. PS This week’s (or is it last’s ^^) John Oliver bit about the Burmese getting their news from FB is eye-opening and chilling.